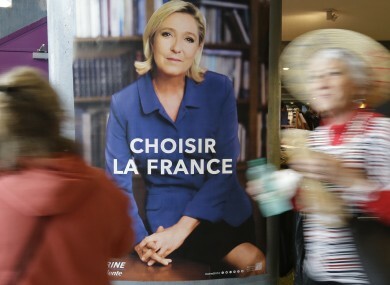 FRENCH SHOPPERS WOULD be paying for their baguettes in francs within a year if far-right candidate Marine Le Pen wins the presidential election next weekend, her Front National (FN) party’s deputy leader said today. “One year later, you will very probably pay for it in francs, a new franc. Not the old franc but a new national currency,” the FN vice president told France Inter. Le Pen, who has campaigned to pull France out of the single currency eurozone, said Sunday she would introduce a “new currency” if she wins on 7 May. But she made the distinction between a new currency for daily use and the euro that she said would be retained for “large companies who trade internationally”. “Afterwards there will be a referendum so that the French people can have their say on the agreement that is struck,” he said. His remarks contradicted those of Le Pen’s niece, FN parliamentarian Marion Marechal-Le Pen, who said on Saturday the talks could take “several years”. Le Pen has repeatedly said that she wants to negotiate with the EU to “restore monetary sovereignty to the French people” and would hold a referendum on whether France should remain in the EU. But since finishing second in the first round of the presidential election on 23 April, she has been accused of muddying her position, especially on the timetable for negotiations. Under a deal struck on Saturday with eurosceptic Nicolas Dupont-Aignan to attract the 1.7 million votes he garnered in the first round vote, Le Pen said abandoning the euro was not a “prerequisite”. She insisted yesterday that there was “no contradiction” in her policy on the euro. Philippot said today that as president, Le Pen would “of course” pull France out of the euro. Email “'If Le Pen wins, you'll be buying bread with francs this time next year'”. Feedback on “'If Le Pen wins, you'll be buying bread with francs this time next year'”.